I’m a self-taught minimalist (I don’t think there’s classes for it or anything? I could be wrong), and am proud of it. This particular life philosophy has enriched my life by getting rid of literal and figurative clutter. Since then, everything has been simple, and stress-free (for the most part). In this case, vacationing becomes fairly simple, as I strive to pack as little as possible, which minimizes any sort of overseas purchases. But on this last trip to Europe, I actually did purchase things. Candy. Chocolates. Boozy Chocolates. Nougat. Ice cream? (“Welcome to Munich International Airport, may I check your ba– what in god’s name is dripping from your…oh my god, can I have some?”). Suffice to say, I pretty much went to Europe to purchase high-quality sugar in various shapes, sizes, and phases. Of all these sweet concoctions, my only encounter with nougat was when I was a kid, knarfing* down Snicker’s bars after swimming meets. I had no flipping idea what it actually was. The way I saw nougat was that “brownish-white stuff stuffed in the chocolate, probably colored sugar.” Little did I know, real, traditional nougat was really made out of honey sweetened egg-foam and interspersed nuts (sometimes dried fruit). *knarf noun. Frank, backwards (courtesy of my friend, Tanya). verb. 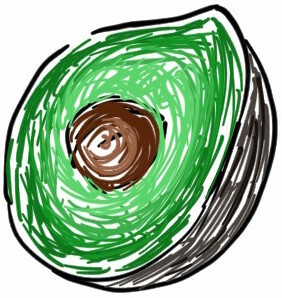 To vigorously shove into one’s mouth; to consume rapidly with no attention to taste or texture. At its very core, foam is essentially air that’s pumped into a liquid that is sturdy enough to overcome gravity (for a period of time), stabilize at the interface, and create bubbles. A good example would be the one from a couple weeks back, in the failing gelato post. Milk can create a foam, temporarily, but water, cannot (at least, without additional help). We can whip or blow bubbles (carbon dioxide) through a straw and create bubbles within the water, so for that one millisecond, there technically is a “foam” in the water (a very large foam, with countable bubbles). However, the force of gravity and the liquid nature of the water is not strong enough to “stabilize” at the surface. When this stabilization is not possible, we get what I like to call, “slow drainage of the walls” (of the bubble). Plain water, in this case, would simply just drip down the bubble wall, right back into the entirety of the liquid, and these bubbles would supposedly “pop.” This basically means the bubble wall cannot keep the water molecules around long enough, as gravity is constantly pulling water down, and water, in its pure form, moves fairly freely. This is why we have things called stabilizers. Stabilizers (like starch, pectin, or gums) prevent the free movement of water. Less movement of water equates to sturdier bubble walls, and sturdier bubble walls drip less and make nice foams. Great. Foams incorporate air into your dessert, or food, or candy, or whatever, and it makes them taste light. I’m on cloud-effing nine. But what about soy lecithin, or gelatin? Are the foams they make any different from egg-white foam? How do they work? Nougats are uniformly sweet, light, and airy, with some interspersed nutty crunch. Given those ingredients…guarantee me some delicious nougat. Sell it to me. 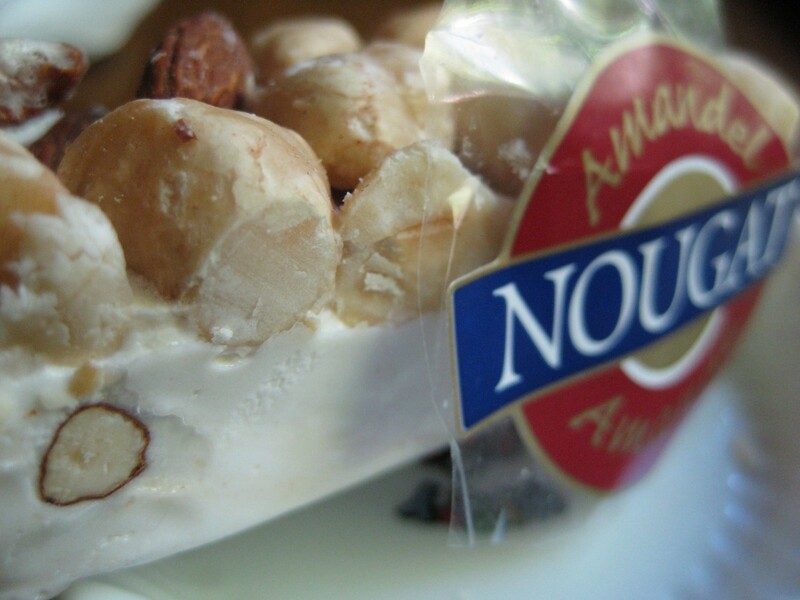 Talk nougat to me, baby. We can start with the most natural to the most synthetic. Chemistry abounds. Beat egg white hard enough, and you’ll create a wonderful white foam. This happens because of the protein present in egg-white, which act as stabilizers. Egg whites are approximately 80% water. The rest are proteins, most notably, ovalbumin, conalbumin, ovomucoids, and lysozymes (one of them could probably be called blahblahblah, and you’d continue reading anyway). 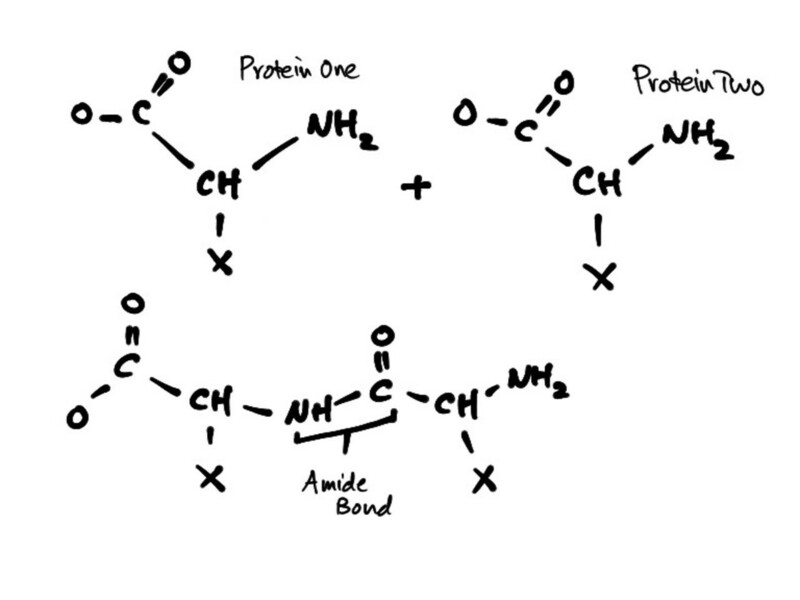 Proteins in this case, are stabilizing water through the creation of amide bonds. Agitation and kinetic energy from whipping gives the proteins energy to form and break bonds, adding structure to the water. More structure and “less drainage of the walls” makes a foam. Figure One’s all about two proteins becoming one. The amide bond is labeled. 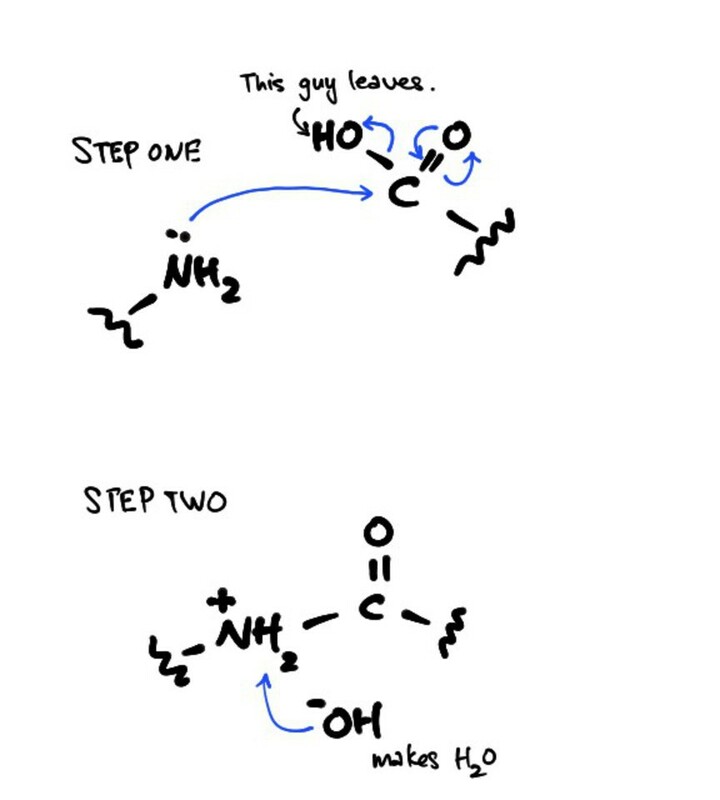 Figure Two’s all about how the amine (NH2) group attacks the carboxyl (COOH) group. Electron-musical chairs ensues (blue arrows). Hydroxyl group (OH) gets angry and leaves, steals a hydrogen somewhere else to mitigate that anger, and makes water. A amphoteric protein. (Amphoteric meaning, it can act as an acid (electron receiver) or base (electron donor). If you’ve ever taken basic chemistry, there’s 20 amino acids. Gelatin contains a bunch of them. 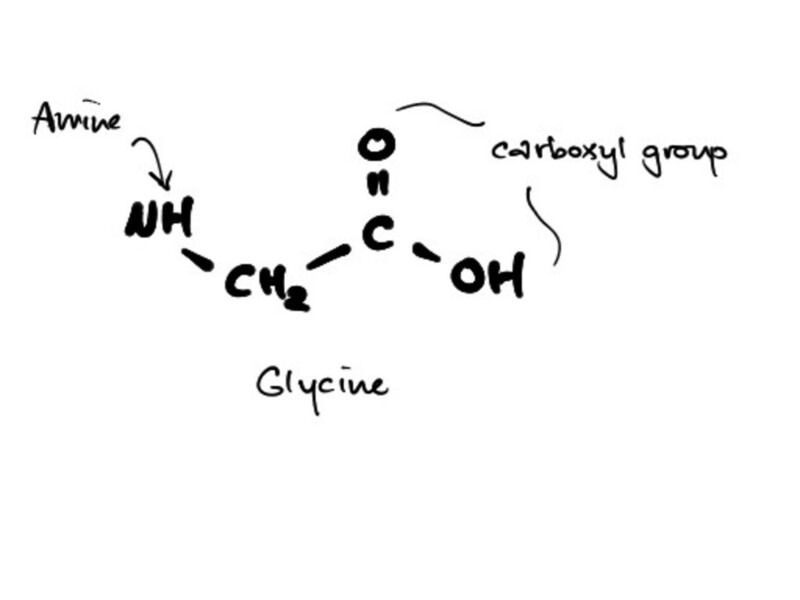 For simplicity purposes, it’s mostly glycine. (Figure Four). The rest 80% is amino acids and amino acid derivatives and all that gunk. 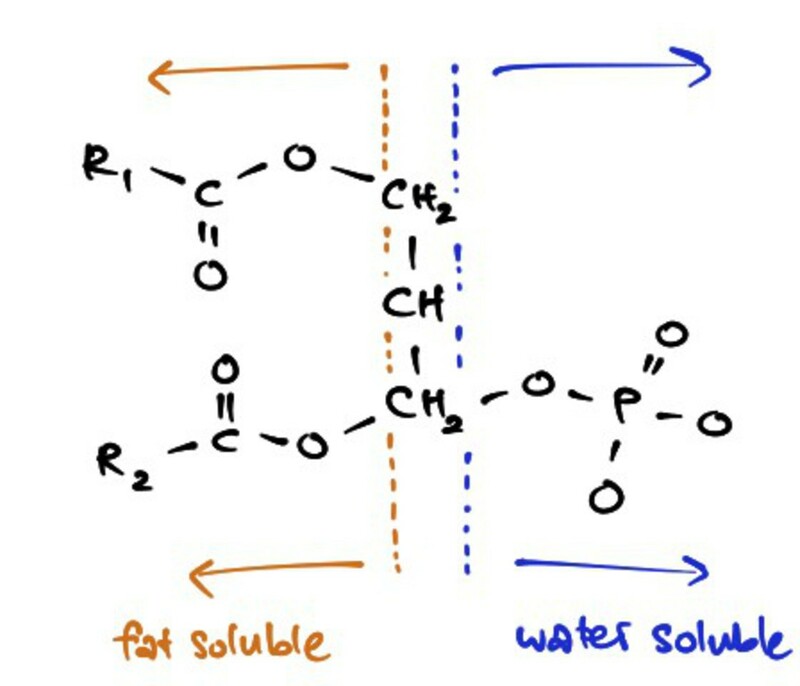 It’s versatility and ability to form matrices is highly dependent on the acidity of the solution (the pH would essentially dictate whether it would act as an acid or a base, as the amine group and the carboxyl group would have different protonation states (less or more hydrogens)). In all these cases, it would allow “less drainage of the bubble wall.” (Take away lesson, I guess?) Awesome foams. Delicious concoctions. No gross, dense nougats. Think about it the next time you decide to knarf a Snicker’s bar. Site update: I moved to a dot com. Yay. I still want to change the way the site looks, and I’m kind of computer-graphics/design/wordpress challenged. Boo. Updates and expansions to come (slowly). Have some nougat. Few things in life are so clearly labeled.